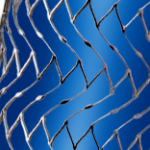 The investigators concluded that stent placement for iliofemoral venous outflow obstruction results in high technical success and acceptable complication rates regardless of the cause of obstruction. As summarized in Circulation: Cardiovascular Interventions, the investigators searched the MEDLINE and EMBASE databases for studies evaluating the safety or effectiveness of stent placement in patients with iliofemoral venous outflow obstruction. Data were extracted by disease pathogenesis: nonthrombotic, acute thrombotic, or chronic postthrombotic. Main outcomes included technical success, periprocedural complications, symptom relief at final follow-up, and primary/secondary patency through 5 years. A total of 37 studies reporting 45 treatment effects (nonthrombotic, 8; acute thrombotic, 19; and chronic postthrombotic, 18) from 2,869 patients (nonthrombotic, 1,122; acute thrombotic, 629; and chronic postthrombotic, 1,118) were included.